Morningstar has added MPPT to their ProStar line of controllers! 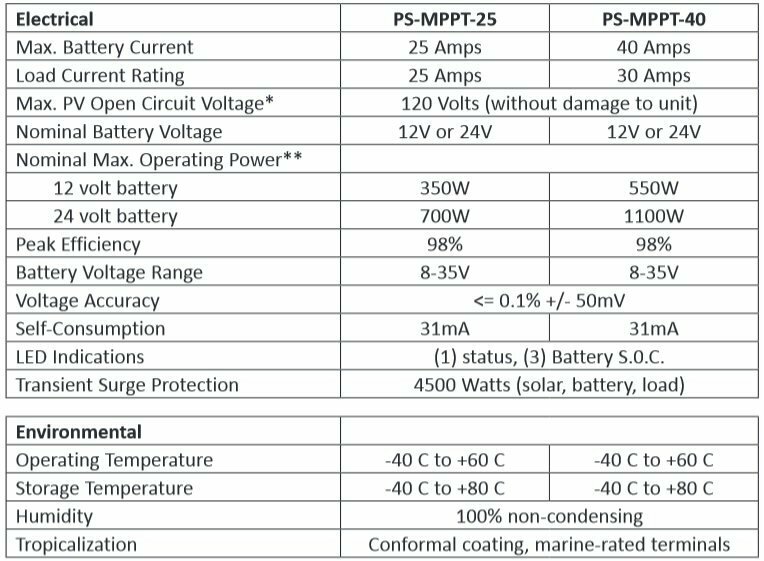 This 25A MPPT Charge Controller comes with a Meter Display, and is capable of charging all battery types, including Lithium Ion.This is the first mid-range MPPT controller fully UL and IEC listed, that has integrated lighting and load control. The NEW ProStar MPPT™ is a mid-range MPPT solar charge controller with TrakStar Technology™ that provides maximum power point tracking (MPPT) battery charging for off-grid photovoltaic (PV) systems up to 1100 watts. This device is ideal for industrial and residential applications. An optional Wire Box for the ProStar MPPT controller provides a wiring compartment with knockouts for conduit and cable glands. It provides for a cleaner, safer install. You can apply more input on the controller than it's rated for. Output current will be limited to the max controller current rating. This allows you to get optimum usage of controller capacity. The advanced electronic design offers long life and reliability. The 3 independently controlled high frequency MPPT stages use Morningstar's TrakStar algorithm, giving you up to 15-30% more power out of your solar array versus a PWM solar charge controller. The connections have up to #2AWG power terminals which are extremely robust terminal connections for a controller of this size. This is very useful when the controller needs to be a long distance from the array. It is highly recommended to add the optional RTS (Remote Temperature Sensor) as the reading will come directly from the battery. This allows for a more effective charging and monitoring of the batteries. **Input power can exceed Nominal Maximum Operating Power, but controller will limit and provide its rated continuous maximum output current into batteries. This will not harm the controller (reminder: do not exceed Voc). ProStar controller part numbers that end with an 'M' feature the optional digital meter display (PS-MPPT-25M, PS-MPPT-40M).